From Grasshoppers and Mice to Monkeys and His Sister? David W. Thompson (MS ‘78) is the Chairman, Chief Executive Officer, President, and co-founder of Orbital Sciences Corporation. ENGenious sat down with him to learn about his time at Caltech and the other experiences that inspired him to start one of the world’s leading developers and manufacturers of smaller, more affordable space and launch systems. ENGenious: What inspired you to become an engineer? Thompson: When I was three years old, my father took me outside in our backyard one fall evening, just after sunset. We looked up in the sky and saw a bright object that had the appearance of a star, except it was moving very rapidly. It was one of the early Russian satellites. Ever since that moment, I’ve been fascinated by rockets and spacecraft. 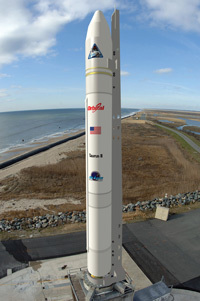 As I was growing up, it was natural for me to design and build my own amateur rockets. Using them, I would launch objects into the sky, which ranged from homemade electronics to grasshoppers and mice, on experimental flights. The largest of these rockets eventually reached about a mile in altitude and carried a small monkey.1 Had I stayed in high school one more year, my sister was next up on the passenger list. Fortunately that didn’t happen, and instead I was off to MIT for my undergraduate degree in aeronautics and astronautics. ENGenious: Have you had a similar influence on your own children? Thompson: Yes, perhaps to an extent. My daughter, Maggie, is more interested in space science than in the engineering focus I had. She has grown up with satellite projects being discussed at home and has traveled with me to rocket launches from a variety of places around the world, from Kazakhstan to French Guiana to Cape Canaveral. Most of all, she was particularly inspired when we attended a meeting some years ago that was honoring the Jet Propulsion Laboratory’s contributions to the space program. At that dinner, there were three past directors of JPL as well as Dr. Charles Elachi, the Lab’s current leader. She got to meet all of them and was especially taken with Dr. Lew Allen, who headed JPL in the late 1980s. That really sparked her interest in astrophysics, which is the field of study she’s decided to pursue in college. For the past two summers, she’s helped Caltech scientists analyze information from an infrared astronomy satellite called WISE, which JPL operates for NASA. From this work, Maggie has more than 20 newly discovered sub-stellar brown dwarfs to her credit so far. 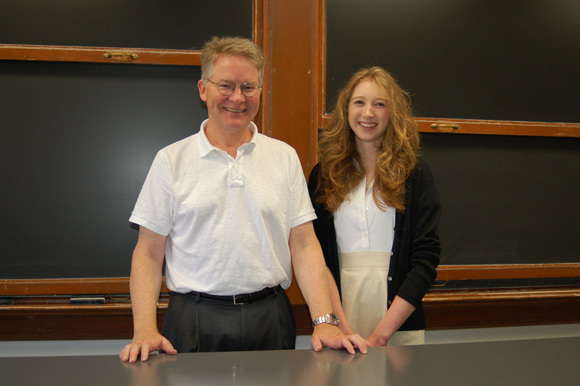 ENGenious: How has Caltech influenced you? Thompson: As a Caltech graduate student, I was particularly intrigued by a case-study course taught by GALCIT faculty and visiting lecturers that chronicled the development of different aircraft and satellites. 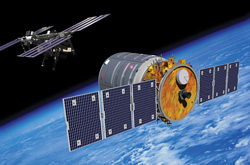 I was very interested in a satellite made by Hughes Aircraft Company called the HS-376, which for many years had the distinction of being the best-selling communications satellite in the world. In the course, I learned about not only the technological aspects of designing it, but also the marketing and the financial challenges of building it into a successful business. As I pursued an MS in Aeronautics, an idea started to take shape—it originally struck me one afternoon when I was studying in the Kármán Laboratory at Caltech —that it should be possible to create a commercial rocket company. After graduating and spending a couple of years working at NASA as an engineer, I decided I didn’t know enough about business to do this right away. Instead, I went to business school, where I got together with a couple of fellow students and carried out a research project for NASA looking at new opportunities in space commerce. After completing our MBAs, we continued to refine the commercial rocket idea. I ended up going to Hughes Aircraft, which was heavily populated with Caltech graduates. For a year, I worked at Hughes during the day and further developed the concept for the company at nights and on weekends. My former schoolmates and I developed a more refined business plan that finally led us to incorporate Orbital in the spring of 1982. So the original, somewhat vague idea I had at Caltech as a graduate student in 1977 led, five years later, to the founding of Orbital. ENGenious: What is a typical day for you like? Thompson: My family and I live in northern Virginia, close to where Orbital is headquartered, so I have something unusual in the Washington, D.C., area—a short commute to work. There is a certain degree of predictability in my schedule on a monthly cycle, but not so much on a daily basis. One day may be quite different from another. For instance, Orbital may have a customer visiting the company who wants to see how one of the satellites we’re building for him is coming along. Or, if it happens to be a particular week in each month, we’ll have a couple of reviews of the business results from our operating divisions. Perhaps I then would have a lunch meeting with a new group of employees to ask for some of their ideas and impressions while they’re still pretty new to Orbital. Afterward, I might spend some time updating a presentation that will be used with investors to keep them apprised of the company’s progress. Later, there might be a rocket program that has some problems that need to be investigated, or I might have a meeting at NASA headquarters or at the Pentagon. And before I know it, it’s time to go home for dinner. ENGenious: As a CEO, do you still use your technical background to make decisions? Thompson: Yes, I do. Let me give you a recent example involving our communications satellites. We’re always trying to improve their basic economic figure of merit, which is essentially the capacity of the satellite to generate revenue divided by the cost to build and launch the machine. It costs roughly $100,000 per kilogram to manufacture and deliver a satellite into orbit, so anything we can do to reduce its mass is extremely important. To this end, we have been looking at changing our propulsion system to use much higher performance electric thrusters, as opposed to chemical rocket engines, for in-orbit maneuvering functions. 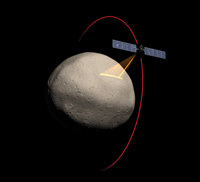 We’ve used similar technology on several deep-space missions for JPL, including the Dawn asteroid probe that is now in orbit about a large main-belt asteroid called Vesta. Next year, Dawn will restart its electric propulsion system to transfer to Ceres, the largest asteroid in the solar system. The spacecraft was launched about four years ago and has already traveled a couple of billion kilometers, but without its electric thrusters it would have been too heavy to reach one asteroid, to say nothing of a second. With that experience, we’re now looking at whether ion propulsion or a related technology is sufficiently mature to be applied to commercial satellites. Decisions at this level—assessing whether the value to customers of using a new technology outweighs the risk of that technology—are the types of things I get involved in. But when it comes down to the engineering details, there are people at Orbital much smarter than I am to do that work. ENGenious: Why is Ceres interesting? Thompson: It’s a huge proto-planet with a surface area about seven times that of California. It’s believed to be the only asteroid massive enough to have been pulled into a completely spherical shape over billions of years. And it’s also thought to contain quite a bit of fresh water in the form of ice, with some scientists speculating that there may be more fresh water on Ceres than there is on Earth. If proven to be correct, this would make Ceres a popular destination for future deep-space missions, because not only is water vital to life, but its constituents, hydrogen and oxygen, are the best chemical rocket propellants that we know of. Just think: 500 years from now, Ceres could be the equivalent of a Middle Eastern oil field today. I’m afraid we’ll have to leave that to future GALCIT entrepreneurs to capitalize on. ENGenious: What advice would you give to aerospace students who are thinking of going to industry? Thompson: Well, the aerospace business has changed quite a bit in the 35 years since I first came to Caltech. The fundamentals of fluid mechanics, structural materials, propulsion systems, and so on remain important. But other technical areas have assumed greater prominence, such as systems engineering, communications and information systems, electronics, and software. The content of a new aircraft or satellite is now much more weighted toward some of these new disciplines. Therefore, one part of my advice to students would be to pursue a broad curriculum that provides a solid grounding in the traditional disciplines, but also covers aerospace systems engineering, electronics, communications systems, and software. A second suggestion is for students to get some early exposure to the practices of aerospace program management to give them a frame of reference for their subsequent careers. Many Caltech students are destined for positions beyond that of an individual technical contributor. They will become program managers, vice presidents of engineering, and heads of companies. In fact, we have a good number of Caltech graduates at Orbital in those positions today. The new GALCIT that has emerged in recent years, with closer connections to JPL in the space-systems engineering areas, is doing just that. It has always been strong in the fundamental aerospace sciences, but it’s now emphasizing engineering and program management practices as well. The future for students at GALCIT is really bright. I can’t wait to see what comes out of the current generation of Caltech students!